Hello there. And welcome to this Instructable for the most observed, yet underdeveloped article of clothing you will wear when you are dressing to impress. Today, you will learn how to tie an Eldredge Knot. Firstly, you will need the nicest suit you have. Seriously. It does you no good to tie your tie this way with frumpy threads. Shine you shoes. Iron you shirt. Match everything. Know what you're about. You should look so good before tying this tie that you regret going home at night because not enough people saw you. That's how you should look. That's the mind frame you should be in. Others should count themselves lucky that they were in your presence tonight, you looked that good. Now that you are in the correct mind frame, with the correct clothes, having cleaned up as well as you can muster, we will now tend to your tie. Look at the images above. What do they all have in common. They're all bright or stand out in some way. You can see the knot at the collar. That is the tie you should choose. It shouldn't come with shapes, or stripes, or any noise or any kind. The tie you choose should be simple, elegant, and stand out against your shirt and suit. See how the third image sort of blends with the collar it's around. That's not good. Not because the tie is bad, but because the shirt is mismatched. It's too dark compared to the tie. It doesn't contrast enough. Avoid that. But enough about style. After all, one of the requirements is that you know what your about. So with that, let us begin. Put the tie around your neck. That seems simple enough. You can put your collar down before the tying even begins. I have. And I'm awesome. So too can you be. The important thing here, other than the tie is correctly around and underneath your collar, which is obvious, is that the thicker, observed part of the tie is where you want it. A tie is an arrow which points to that which you want the ladies to look at, if you know what I mean. The tip of the tie should be as close to the edge of your pants without going over, not unlike The Price Is Right. A tie hanging in excess is just tacky. And you don't want that. You shined your shoes today. And not for nothing, but you'll want as much room on the other end of this tie as possible. I'm 6 ft tall and, as you will see, I barely have enough tie to finish. Begin the process of folding your Eldredge Knot. Once you start this process, you're committed until the half way mark. Also, don't be intimidated by repeat failure. In making this, I had to complete the knot twice. It took me the better part of twenty tries to do it. And I'm good at this. Also, you want to do this near a mirror so you can check and re-position your tie. 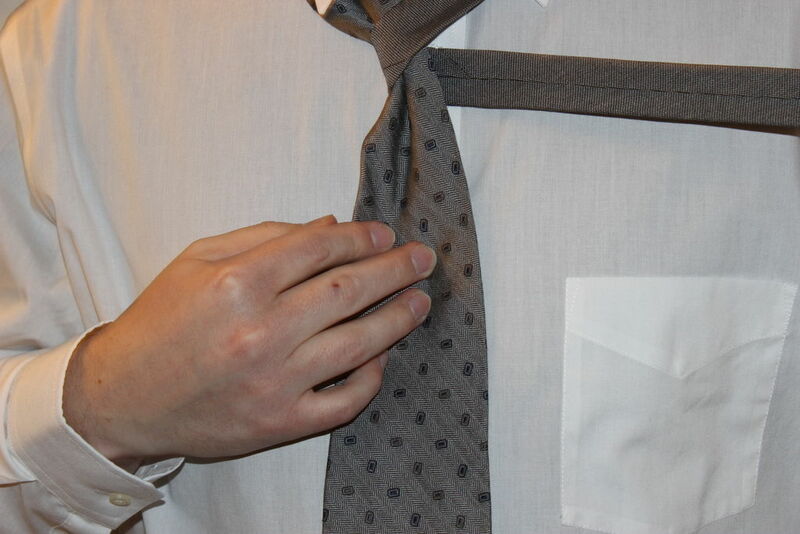 Now, start by wrapping the thin part of the tie around the thicker part, top first as show below. This should be done as near the collar as possible to maximize the amount of tie you have to work with. Now, bring the thin part of the tie, form now on referred to as the tie by me because of laziness, up. This is by far the simplest step. Hence the confusing first sentence. I can't make this too easy. Wow. The light hits that tie really weird. It makes it look brown. That's kind of interesting, if divergent from the topic. Weave your tie through the hole at your neck as shown below. It is very easy starting now to twist your tie so that the seamed edge can show. This is bad. Don't do this. Observe the image below. The seamed edge of the tie is out. You will need to take special care from now on to ensure this. Wrap the tie across as show below. Also up as show in the illustration. I know it is getting hard to see because of my gorilla like hands. But we will both have to make due. Make sure when you fold up that it is underneath the knot. You should endeavor to tighten as you go. It will help with appearance later. Once again, fold though the hole around your collar. This time, it should be forward with the seamless side of the tie out. And for the third time, wrap behind the knot. But this time, when you bring it up, bring it through the tie as shown below. It will be a little jarring the first time. You will have to loosen the section that you are going to put the tie underneath so that you can tighten it again. If you loosen it too much, the knot will come undone. If not loosened enough, you will struggle and the knot will fall apart. It will take some practice. Now we tighten the first half of the knot. Look at the second image. It is important that your tie looks like that when you are done with this step. If it doesn't, you need to fix it or start over. Notice the crossing of the two pieces of fabric. Notice the thin horizontal strip that ever so slightly protrudes from the crossing.That is what you're after. Also, the entire knot should be tight when done with this step. This is the half way mark. Everything done after will be on top of this. It will not effect this section of the knot. It should be noted that some pulling and tugging goes along with this knot. Don't be afraid to adjust the knot to where you want it, as long as it looks like this when done. Now you are at the half way mark. You can now take a break and do the wife, girlfriend, or boyfriend thing. I'm all inclusive. Move around a little. Get a drink of water. I'm going to get a drink of water right now. And I'm writing to tell you about it. Because this is the half way mark. And I do what I want. Now comes the tricky part. Wrap the tie through the hole and onto the same side it was on previously. That is to say, do not cross the the knot. See the illustration for more detail. I'd have a picture. But as previously stated, gorilla hands. There is nothing I can do about being large, stylish, and manly. Now, wrap the tie up. The illustration is by far clearer than the picture. Holy cow my hands are in the way. This just goes to show how little tie I and you have to work with. If you are a little shorter, you will have more room to work with here. If you are taller, good luck. Wrap the tie through the hole at your collar. This is another place where it is easy to get the tie turned around. See how the seamed side is facing out. It should be for you too. At this point, you will definitely be noticing the lack of free tie in your hands. This just means that you will have to be more delicate with your knotting. Wrap the tie around and through the previous loop as shown below. Then tighten. Some of you will have more of a tail than me. That is fine. If you have less of a tail, that is a problem. The knot may become loose and untie if the tail is at least not sticking through as shown below. And now you fidget with it. That rhymes. You want to make very subtle movements to get the overlays of the knot as shown below. Depending on how much tie you have left, you may not have a lot of room for maneuver before you have to readjust for the previous step. Tug the knot down a little. Make sure it's secure underneath the knot. Tug a little more. Make sure it's secure. Repeat until a classy look is achieved. When this is done, pull up on the knot and down on the large end of the tie. If you have a tail, tuck it under your collar. You may wish to place it behind the section of you tie around your collar for security. But I've never had a problem with a tail falling out of my collar. Lastly, puff out the large part of your tie at the base of the knot. It is not shown in the picture below, but I do it in the following video. You may notice that this knot is very one sided. That is to say that only one side is responsible for the knot. So, unlike a Windsor knot, this cannot be untied easily. If you plan on getting into a street brawl, this is not the tie knot you want to be wearing. I'm just putting that out there. Because I'm considerate like that. 1) I'm tugging on the knot constantly. 2) My choice of tie is a little too dark to fully appreciate the knot. But everything else about it is correct. 3) I puff out the large section of the tie at the end to give it a fuller appearance. 5) It took several tries. This is complicated and there are several pitfalls. 6) Seriously. That is one stylish tie. For this step you will need a comb. While holding the comb in your right hand approach the mirror. Move to start combing your hair. Realize that you look really good. Motion your hands slightly outward in recognition of how good you look. Do nothing else. This is known as The Fonz. See the following link for a demonstration. If you have followed all steps, you now look so good that you can honor The Fonz with that move. Put your suit jacket on and have the time of your life. Make the ladies swoon. Make the men jealous. This isn't the knot you wear to a cocktail party. This is the knot you wear when you want to change your own life for the better. This is the knot you wear when the world is yours and you want everyone else to know it. You look good. Let everyone know it. This is a freaking epic way to tie a tie! This might be the coolest way to tie a tie. I met someone wearing their tie like this once and it was quite impressive. The video is very helpful too!